This is probably a final post before resorting to mobile phone tweets on Twitter. Later today we’re off down to spend tonight in an airport hotel at Gatwick ready (?) to check in at about 4:00 AM tomorrow. Yuk! The universally difficult task of selecting and packing appropriate clothing for our activity holiday is well underway. It’s easier when one knows precisely what one is getting into but that’s not as exciting, is it? At least we don’t have to carry the clothing with us (at least, I hope not – yikes! ), just the camera gear, water and walking essentials. We’ve decided to cut down on photographic weight by sharing lenses rather than duplicating them. Carol’s going armed with our “standard” lens (17-85mm) and I’m taking the super-wide (10-22mm) and longer (75-300mm) telephotos. I bet everyone else will have compact cameras, sensible people, but lugging this lot will give us more exercise. 🙂 At least the tripod isn’t going – thank technology for image stabilized lenses and adjustable ASA settings. 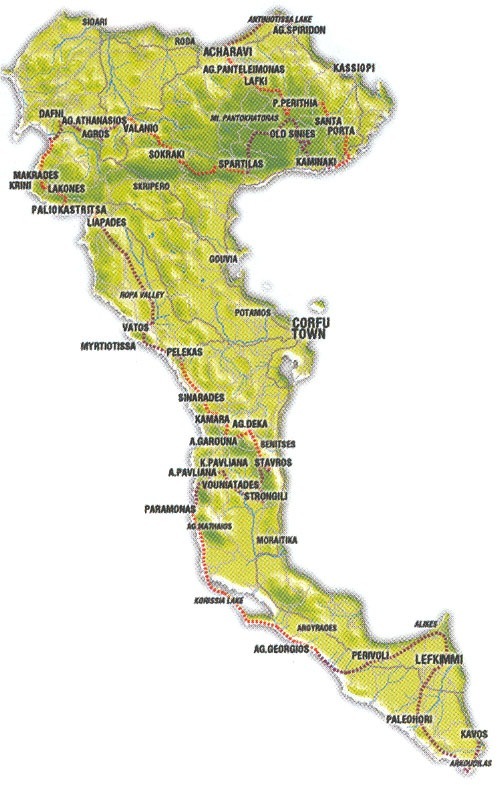 I found this reasonable map of the Corfu Trail itself to follow progress. The path certainly does snake about over the island. The recommended route is from south to north and that’s what we’ll be doing. We’ll meet the other Explore gang on Saturday evening and the walk itself begins on Sunday after transferring from Corfu Town to the south of the island. The walk is split into two 5-day sections with a rest day between at Liapades Beach. Watch the legs seize up! I suspect the main requirement there will be laundry – what fun. The last couple of northern sections seem to be the toughest but, hopefully, we’ll be a little fitter and a few pounds lighter by then. You got to be joking, all that olive oil and all those olives in your Greek salad, compounded with all that C2H3OH. Sounds a high calorie diet to me. Now if you were carrying my metal tripod I might agree. But I get through unfeasibly large amounts of olive oil and C2H3OH when I’m at home, anyway. This is just extra exercise. 1 Pings/Trackbacks for "Almost Gone"